Ali McWilliams is an Entrepreneur, Personal Trainer, Group Fitness Instructor, Life Coach, Consultant, Mentor, Speaker and NBC Fitness Expert. With almost 20 years of experience in the health and fitness industry, Ali’s passion continues to grow as she works to speak truth, light, strength, and positivity into women’s lives, helping them be their best selves! Her ‘soul’s’ purpose is for women to live in complete wellness – having a strong and healthy, mind, body and spirit, and for them to know who they are and why there are here. TrainingTips.com: Can you tell our readers a bit about your Fitness Philosophy? Ali: I believe that fitness is far more than just the physical aspect. Having a fit and healthy mind and spirit creates greater appreciation for the physical and helps the physical become more of a lifestyle change or way of life. It all starts with the mind. Healthy thoughts create healthy feelings which then create healthy actions, ultimately leading to a richer life overall. TrainingTips.com: What advice would you give to someone who is normally fitness focused but is less motivated in the winter months? Ali: Good question as this is hard for any of us that live in colder climates. Find an activity you really enjoy. The more you enjoy it, the more likely you are to stick with it. You can also get an accountability partner or Fitness Coach which is very helpful during this time of year. They can help you stay on track, keep you motivated, hold you accountable, etc. Although consistency is important year around, lowering the intensity during the colder months creates less stress on the body which in return can help give you more energy and even weight loss. TrainingTips.com: Congratulations on recently reaching your 5 year business anniversary! What are some of the biggest lessons and insights that you’ve gained during your entrepreneurial journey? Ali: Thank you! Learning more about myself and what my core values and strengths are have helped me enjoy my business even more and has allowed me to go down paths that are best suited for me and my clients. Becoming a certified life coach has really propelled me personally and professionally. 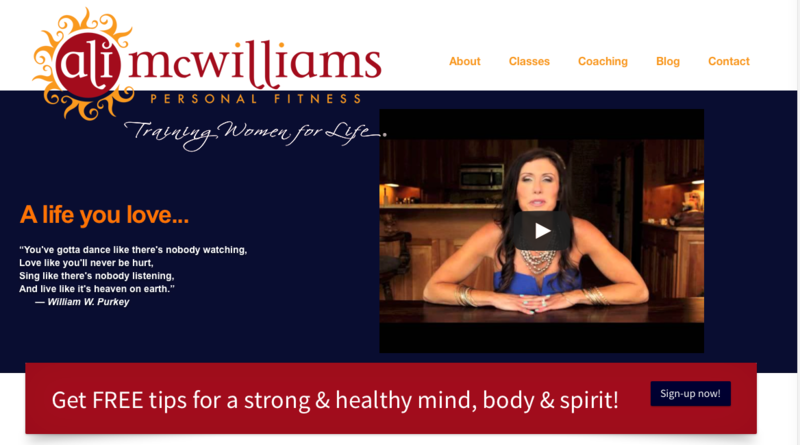 At first I was a bit fearful to blend life coaching with my fitness business. It was so different than what I was doing and what was out there. I wasn’t finding fitness experts doing what I was doing, but boy am I glad I did! Women are longing for more. They have done the weight loss groups, trainers, fad diets, etc. and have gained the weight back and are right back to where they originally started, or even more defeated. I believe women are realizing it needs to be more than just the physical that needs to change and they’re ready! They want a lifestyle change and want to dig deep in order to move forward towards self-acceptance and a fuller life. They are longing to have a stronger and healthier mind, body, and spirit! TrainingTips.com: What are some of the biggest mistakes you see clients make when it comes to working out and how can they be avoided? Ali: MISTAKE #1: The “all or nothing” mentality. A lot of women seem to think that wellness is black or white. They’re all in or out. There are no grays or in betweens, but that’s not how life works. We all have our highs and lows. We all have our “off” days. If you fall off today or all weekend, it’s ok, just start over the next day. Drink water, sweat, eat clean and you’ll be great. None of us are perfect all of the time. Learn to accept it. Don’t beat yourself up about it and move on. Stop punishing yourself. MISTAKE #2: No time. I think once women look at themselves as being enough and worthy, they start to make time in their schedule for self-care and start to take control over their wellness journey. Remember, self-care is not selfish! MISTAKE #3: Always focusing on the goals and not celebrating the successes. My clients have so many successes every week and if we didn’t stop and reflect on them, reaching their goal would be so much different. If we only focus on the goal, once we reach the goal, its not enough, we aren’t as happy as we thought we would be. Celebrating the successes (saying no, getting more sleep, taking time to breathe, balancing meals, coming to strength class, drinking more water, speaking their truth, not eating the cookies at work, etc.) are all daily successes that so many of us forget about but are a HUGE part of our wellness journey. They do not have to be just fitness successes they can be emotional and spiritual successes as well. Not reflecting on weekly successes does more harm to us than we might realize. MISTAKE #4: Length of workouts versus consistency. So many women believe they have to get 60 minutes of exercise in 6 days a week. Getting movement in for 15-20 minutes 3-5 days a week is hugely beneficial. It can lead to working out longer once you get moving and keeps you consistent. Not to mention you always feel better after a workout. MISTAKE #5: Women often believe being physically fit alone is enough. When in actuality it comes from being mentally and spiritually fit as well. TrainingTips.com: What are some of your favorite moves to get motivate and inspired first thing in the morning? Ali: To get inspired I listen to a faith based podcasts in the mornings while I get ready. This helps me center myself and focus on what’s really important. It also helps put things into perspective. When I am training, teaching, coaching, or speaking, I want to give my clients the best that I can. I can’t do that if I am distracted by what the world is saying and doing. I need to stay focused on why I am here and how I can enrich the lives of others and podcasts help me do that. I also pray in the morning. As far as moves go I love to go for a walk, jog, or run to get motivated, it all depends on how I feel. I also love going to a local fitness facility once a week, where they design a workout plan just for me. It’s nice to be the student and play. Going to a facility that has toys (aka equipment) that I don’t have is fun for me. I like variety and I like being around other people when I workout. TrainingTips.com: What would you say to someone who is physically fit but also facing feelings of insecurity despite being in great shape? Ali: Retrain the brain. Our negative thoughts are just bad habits, habits that we can change into good, positive habits. We have to believe we are enough and worthy, thats first! Second we have to choose to let more of the good in and stop the bad from coming in – meaning, take every thought captive and only let what is true, good and lovely in. Third, find some affirmations that work for you and pin them up so you can see them. Say them out loud every morning and evening. It sounds corny but it actually works. It helps retrain your thinking patterns and can change your core beliefs about yourself. We have the power to change our bodies energy from negative to positive, all by what we think. How we feel about ourselves comes from what we think, no matter how great of shape we’re in. Perception often equals reality. What are you saying to yourself?